New Young’s SC Wennappuwa scored an easy win over Sri Lanka Police SC 3-1 in the Dilaog Champions League Stage One Group B game at the Police Ground, Bambalapitiya yesterday. The competition is being conducted by the Football Federation of Sri Lanka. Leading 18 teams in the island are taking part in the contest which is being conducted in nine stages in the first round. The competition is divided into two groups – A and B. The first match in the competition took place last Friday where Renown beat Saunders 2-1 after a close game. The tournament commenced with a grand opening ceremony at the Race Course Ground. At the end of the first half New Youngs led 2-0 at the breather. The goals were netted in by Hasitha Priyankara in the eighth minute and foreign player Ankamah George scored the second goal. In the second half the third goal for New Young’s was booted in by Hasitha Priyankara in 68th minute. Police’s solitary goal was scored by Sampath Pathirana in the 93rd minute. 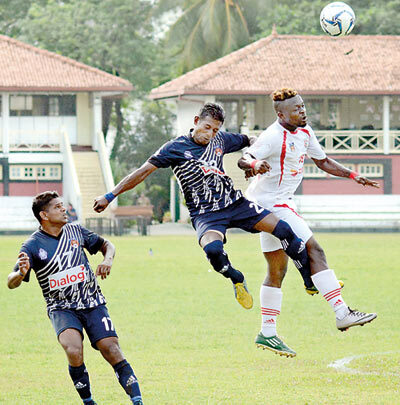 Two other games in Group B were played yesterday where SL Navy SC beat Super Sun SC Kalutara 3-0 at the Vernon Fernando Stadium Kalutara. At the Kelaniya Football Complex Tihariya Youth SC and Java Lane SC figured in a one all draw. In the Navy SC – Super Sun game, the first half ended in a 2-0 lead for the sailors. The goals were netted in by Sanjeeva Chaturanga in the third minute and the second was by Nirmal Wijetunga in the 24th minute. The last goal was by Dhammika Ratnayake in the 86th minute. In the drawn game between Tihariya Youth and Java Lane the first goal was scored by Java Lane’s J.L.M. Alim in the 51st minute. Thihariya Youth’s goal was netted in by T.A.K.G. Perera in the 91st minute. There was no score in the first half. In the opening game on Friday, Renown beat Saunders 2-1. Saunders led 1-0 in the first half.